Hippeis Tarantinoi are the elite cavalry of Taras. These men can be relied upon in any situation to perform as missile cavalry or as melee troops. Hippeis Tarantinoi are a superb elite cavalry that long ago made their home city of Taras, on the southern coast of Italia, famous for its own modest equestrian tradition. They wear light, high quality linen armor and charge into combat with a curved kopis blade and several javelins to weaken enemies for their charge or sustained melee fighting. In appearance and style they are a distinct, traditional Hellenic light cavalry, but fight with far more skill then their less recognizable predecessors from Hellas itself. As a force, they can be relied upon in any situation to perform as missile cavalry or as melee troops, providing that they do not get bogged down in the thick of battle. 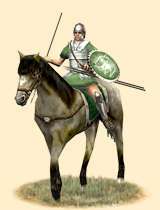 Historically, the Hippeis Tarantinoi were the elite cavalry force of Taras, an old foundation of Sparte on the southern coast of Italia. They were fairly unique among the various cavalries produced in the Hellenic tradition, as outside of the successors of Megas Alexandros, most such states were never recognized for the maintainance of an effective cavalry force - outside of Thessalonika. With them to form an effective compliment to their less impressive citizen infantry, Taras and the cities and Hellenes under its authority were able to hold the Leukanoi and Bruttiai at bay for many years, and were eventually used to some effect in the Epeirote army fashioned by Pyyrhos.